The Vendors Module allows a site owner to designate one vendor to each product on the site. When processing orders, the site owner can download a Purchase Order (PDF format) of all orders that contain products for a particular vendor. 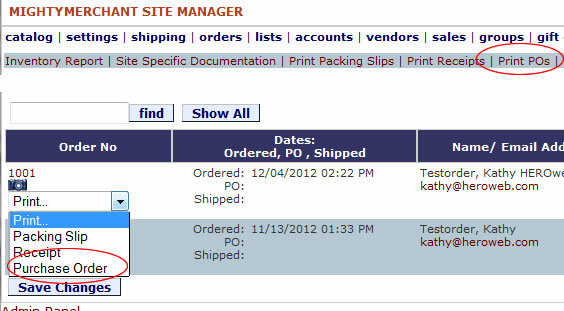 This purchase order can be emailed to the vendor for order fulfillment. 1. Click the "vendors" module link in the Site Manager. 2. Click "New Record" to add a new vendor. 3. Enter information for the vendor, then Save. Set the Vendor Id drop-down menu to the appropriate vendor. In the Order Manager ("orders"), you can create a PDF Purchase Order for all new orders, or for an individual order. You can place a note on the bottom of every purchase order by editing the Purchase Order Note field under "settings" in the Site Manager.